Kershaw Squaw Creek. 2 5/8" closed lockback. 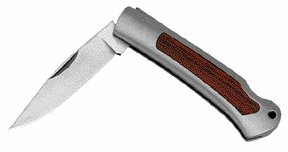 AUS-6A stainless modified clip blade. Satin finish stainless handles with rosewood inlay. Lanyard hole.